SJ Flat Menu - This is a simple yet powerful module to improve website usability and navigation! This module is designed to help you to show multi-level of menu items in the smooth way. Using this module, you can choose to use an accordion or a flyout menu type, horizontal or vertical style, left or right direction and so much more options in the admin panel. This helps to show users all navigational options at a single glance, thus your visitors can easily find what and where they want without having to spend a lot of time. Moreover, this module supports fully responsive, so horizontal type will automatically switch to vertical on smaller screens. This module is totally FREE to download, let download and try it yourself now. 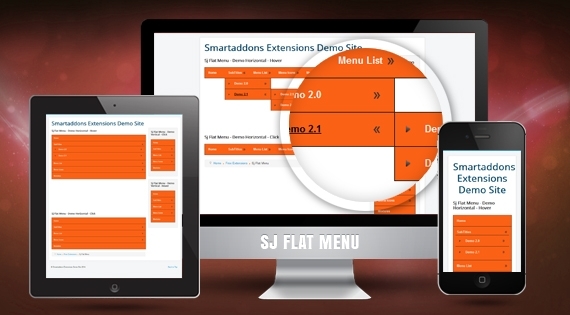 Let view our SJ Flat Menu demo to feel more!